Hibs kept up the heat on Rangers in the chase for second place in the Championship with what, ultimately, proved to be a comfortable victory over ten-man Livingston. Scott Robertson gave the Capital club a dream start after just seven minutes, drilling a low shot past goalkeeper Darren Jamieson only for Myles Hippolyte to pull the basement outfit level. The Lions’ joy lasted barely 60 seconds, however, before Jason Cummings’ 18th goal of the season restored Hibs’ lead. Livingston found themselves playing the whole of the second half a man short after Darren Cole, booked for handball, earned himself a second yellow and an early bath for a studs-up tackle on Cummings. Hibs, however, struggled to make the extra man count, Dylan McGeouch’s 58th-minute penalty was saved by Jamieson after he had been up-ended by Kyle Jacobs. But substitute hitman Dominique Malonga eased the nerves of the Easter Road side and their fans eight minutes from time to slash Rangers’ advantage to a point with just two games remaining of the regular season. Both sides went into this match knowing a draw would do little to further their respective ambitions, Hibs aiming to close the gap on Rangers and Livingston going for the victory which would lift them off the bottom of the table for the first time since November 17. 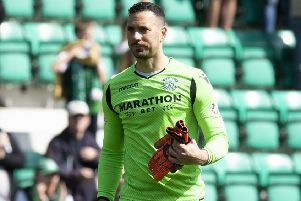 They were, however, both hampered by suspension, Hibs playmaker Scott Allan missing out as Martin Boyle returned having been ineligible to face Falkirk in that disappointing Scottish Cup semi-final defeat at the weekend while Mark Burchill was without captain Jason Talbot. Keaghan Jacobs was also absent for the home side, giving former Hibs kid Bradley Donaldson his first start for his new club while Danny Mullen was also drafted in as Livingston sought to extend their five-match unbeaten run. Stubbs had, again, in the wake of defeat at Hampden in a game his side had dominated but failed to turn their superiority into goals, asked his team to be more clinical inside the opposition penalty box. And with that in mind he would have been delighted to see Robertson convert their first chance, a through ball from McGeouch splitting Livingston’s central defenders Declan Gallagher and Cole to find his fellow midfielder in acres of space. Robertson didn’t give Lions goalkeeper Jamieson any chance to set himself, taking the ball first time and drilling a low shot into the corner of the net. Hibs’ lead, however, was short lived, Gallagher’s high crossfield ball was missed by Jordon Forster, leaving Hippolyte to volley home an unstoppable shot high beyond the reach of Mark Oxley. Incredibly, Livingston hardly had time to draw breath before Hibs were once more in front. Cummings’ first shot was blocked after Liam Fontaine had played the ball into the danger area, but the teenager displayed his predatory instinct as he pounced on the rebound to rattle a left-footed effort through a ruck of players and into the net from 12 yards out. Bairns’ boss Peter Houston’s observation that crosses are often Hibs’ undoing was highlighted again when Callum Fordyce’s high ball drifted over the visiting defence, Mullen getting the slightest of touches on it but unable to trouble Oxley. In the absence of Allan, McGeouch had taken on the role of making things happen for Hibs, the on-loan Celtic midfielder seeing one shot blocked, a cross headed over by Paul Hanlon and then another taken down by the chest of Farid El Alagui who turned and thundered in a shot which thudded into Jamieson’s chest. Hippolyte’s long throws were almost as good as a corner to Livingston and Burchill’s players had shouts for a penalty waved away as one broke off Fontaine, referee Andrew Dallas showing no interest at all in their claims. Livingston found themselves facing a second half with only ten men, Cole, having been booked for an earlier handball, sent off a minute from the interval as he picked up a second yellow for bringing down Cummings 25 yards out. It was an opportunity for Hibs to extend their lead but El Alagui hit the free-kick straight into the arms of Jamieson. Cole’s dismissal meant Kyle Jacobs joined Gallagher in the centre of the Lion’s defence, Burchill having to balance the need not to concede again with an equal requirement for goals at the other end to keep his side’s remarkable late bid to escape the clutches of relegation going. And they went close to equalising again, Oxley only able to push Scott Pittman’s low cross out in the direction of Hippolyte who found himself thwarted as Boyle utilised his turn of speed to see off the danger. Hibs were proving less than secure when confronted with the ball over the top, Donaldson picking out the run of Mullen who forced a goal-saving challenge from Fontaine. The Capital club were offered a glorious chance however, when McGeouch exchanged passes with Cummings only to be sent crashing by Jacobs as he burrowed deep into the penalty area. Dallas immediately pointing to the spot but McGeouch, who had scored a penalty in Hibs’ 4-0 win on their last visit to West Lothian, looked on in agony as Jamieson guessed correctly on this occasion, throwing himself right to push the ball aside. The game was held up for three minutes as Jamieson received treatment, the concern enough for Keith Walker, who last played a first-team game 14 months ago, to remove his tracksuit, only for the No. 1 to signal his willingness to carry on. There was an air of anxiety, though, about the Hibs support, their frustration at the inability of Stubbs’ players to make their numerical superiority count all too evident. Their worries almost disappeared, though, 11 minutes from time when Fraser Fyvie’s deep cross found the head of Fontaine, who was spending almost as much time foraging forward as he was defending, the Hibs skipper’s effort taken off the line by Gallagher before Boyle forced Jamieson into a good save from Malonga’s precise pass. And it was the substitute striker who put the game beyond Livingston. Malonga turned and twisted before firing past Jamieson to leave Livingston firmly rooted to the foot of the table, three points adrift of Alloa Athletic.